Happy Valentine’s Day! Call your grandmother. 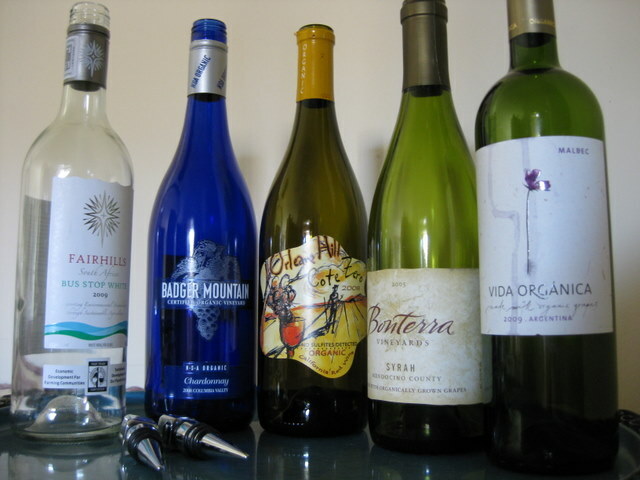 To help you pick a bottle to celebrate your loved ones today, I had a wine tasting this weekend. Experimental Setup: About a dozen people, five bottles of wine (to taste- there were some warm-ups), in my apartment, with a wine aroma guide to help us narrow down the smells and tastes. I’ve managed to find most of the tasting notes my wonderful tasters left behind, and I’ve compiled them (at least the printable ones- descriptions got a bit creative) for you. These were the wines. Four of them are made from organic grapes, and the Bus Stop White is certified Fair Trade. I got the Bonterra Syrah and Orleans Hill Cote Zero (no idea what grape combo that is- bottle has no clues) at the Harris Teeter near Foxchase. They had a decent selection of organic wine, but hidden in with the normal wines, so you have to hunt. The Vida Organica and Fairhills came from Whole Foods in Old Town. The Badger Mountain is from a Trader Joe’s. None of the bottles cost more than $16, and most were under $10. FairHills Bus Stop White, 2009. Fair Trade Certified. Like “getting punched in the face by a grapefruit”. Lots of citrus fruits, and some people mentioned notes of grass and haystraw. Best for sipping on a warmer day on a sunnier porch. I can never think of anything to pair these citrusy whites with myself, but one taster suggested food in cream sauces. Badger Mountain Chardonnay, 2008. Organic Vineyard. Smelled of “crazybutter” (yes one word) with some sort of nut undertones (someone said cashews, but I’m pretty sure they were joking). Nice creamy finish on the taste. I think drinking it with a meal would pull out some other nice flavors, and it would pair well with spicy foods. A note on the reds: I should have let them breathe more. All three were strong and spicy, and a few minutes of air or decanting would have mellowed them and brought out more flavors. Note-taking had also, totally understandably, lost its novelty by this point in the evening. Orleans Hill Cote Zero, 2008. Organic. Smelled strongly of alcohol, with various bits of cloves, pepper, tobacco, and raspberries (“like eating a cigarette while snorting a raspberry”). Would go pretty well with a pizza or other garlic-y tomato-y things. Bonterra Syrah, 2005. Organically grown grapes. We got lots of prunes, raisins, plums, and a bit of pepper here. The finish was dry. Seemed like a serious red for a meal of meats. Vida Organica Malbec, 2009. Organic grapes. This is one of my favorites, but it divided the tasting community (at least the ones still paying attention). Several of us who tend to like malbecs liked it, and others found it completely unappetizing. More time to breathe would have helped, but we smelled lots of alcohol initially, and some noted green tea taste on the ending- a little dryness. After plenty of swirling, the raspberry and other dark berry flavors came out, plus the spice on the finish. The pro-malbec contingent advises you to pair it with anything delicious, since we remember it being really great, but we weren’t really getting very specific at that juncture. Voila. Hope it helps! Have a great Valentine’s Day! yes the malbec was good but, as with most malbecs, it definitely needed to be decanted ten or fifteen minutes before drinking. Did you forget your grandmoms phone number. For wine tasting try near the end Mogan david. love and a happy late valentines day to you.